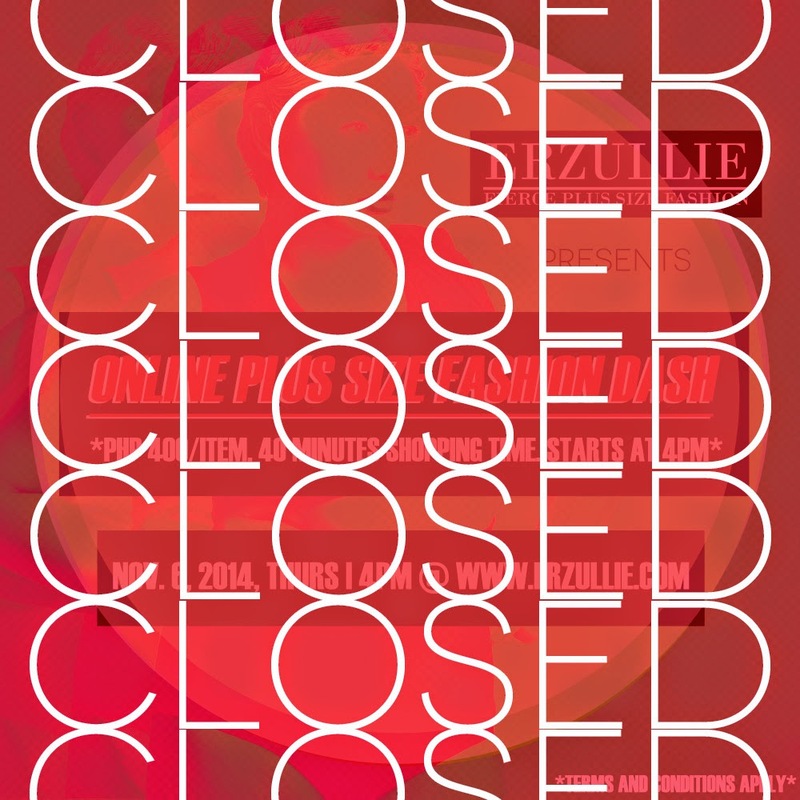 PLUS SIZE FASHION: ERZULLIE’S ONLINE PLUS SIZE FASHION LINE NOW CLOSED! We would like to thank all of the ladies that participated in the first ever, Erzullie Online Plus Size Fashion Dash! PLUS SIZE EVENT: ERZULLIE'S ONLINE PLUS SIZE FASHION DASH STARTS NOW! Everything in the store today, NOVEMBER 6, 2014, THURSDAY, from 4:00PM-4:40PM is just PHP 400 each! May the fierce odds be in your favor. Only order forms that are submitted within the said time frame will be able to avail of this promo. Any order form before and beyond will be part of the regular orders. As always, first to submit, first to be served. Google will document the time stamp for accuracy. PLUS SIZE DESIGNER: ERZULLIE TURNS 4 YEAR TODAY! 4 years ago, right at this moment, 8:40AM me and Berna were getting ready to go to Rockwell Tent to officially open Erzullie Fierce Plus Size Fashion to the public. Global Pinoy Bazaar was the first event that accepted us. It was the door that opened all the love in the world for us. We wouldn’t be where we are now, if it was not for those moments. Fast forward to this --- more than 1,000 entries, 100 styles produced, 10 icons that represented us, countless magazine/blog (both local and international) features, bazaars (Thank you, SuperSale, Global Pinoy and Trendsetter’s), 4 plus size model go-sees, and 5K plus Erzulliestas and a fabulous new showroom. We are truly blessed and it was all because of you, ladies. I know I always say this but if it weren’t for Erzulliestas finding us or us finding them, we won’t be where we are. So my first gratitude is to all of you. Thank you with all of our heart, soul and mind. Our, me and Berna’s, lives would be meaningless if you ladies did not give us a chance to serve you. Thank you also for continuously patronizing and loving the brand for all of it. We really appreciate it. Next, would be of course, the Universe, which is the playground that we are in the first place. Third, would be my team. My Icons (both past and present), you girls are more than my models now, you are my family. Thank you for being naturally you. You have translated our message and brought it into reality for plus size women everywhere to see. My team proper, Azaza Rodriguez, I love you. Thank you for being so professional and creative. Your mere existence brings me joy and we owe a lot of fascinating photos that inspired countless Erzulliestas out there. Ken Tort, my belief that there is a Universal Source out there got stronger when I met you. You are such a delight to work with and the professionalism is just flawless. Mark Alvarez, sir, how can I forget you? We wouldn’t be as high fashion as we are now, if it wasn’t for your skills in photography. Thank you for entrusting me with your loving lights. I promise to take care of it as long as it lives. Fourth, to our production team. Thank you so much for being passionate about your jobs and we are very happy to know that you love working with us as well. Without you our pieces would not manifest. Thank you for being part of our company. Fifth, our families --- of course! Thank you for all the forms of support that you have given us since the start of this endeavor. It was rough but we got through it because of you. Sixth, thank you Villa Sole for having us for almost a year. Thank you also Ms. AF for the new showroom in Eastwood City, and also Miss Diane for connecting us in the first place. Seventh, thank you to all the magazines, TV shows, blogs (both international and local) that featured our fashion line. We are eternally grateful for the opportunity that you have given us. For everyone else that I might have missed, I just want to tell you, thank you. You know I love you and we (me and Berna) are eternally grateful. Here’s to more years of fierce plus size fashion! PLUS SIZE EVENT: ERZULLIE’S ONLINE PLUS SIZE FASHION DASH TODAY! Set your alarm clocks, Erzulliestas! Erzullie’s Online Plus Size Fashion Dash starts exactly at 4PM today, November 6, 2014, Thursday (End time: 4:40PM) at WWW.ERZULLIE.COM. Each item in the online store is only Php 400! Grab this chance today!